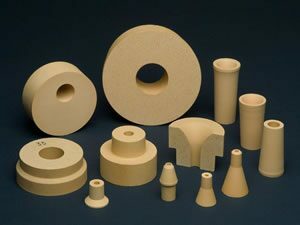 A range of zirconia ceramic based products are offered by Anderman Ceramics, which are manufactured to exacting standards with unique properties, putting our product at the forefront of performance. Metering nozzles are used for the continuous casting of steel as well as zircon atomising nozzles for use in the Powder Metallurgy industry. We also offer a range of crucibles based upon stabilised Zirconia. The properties of the finished product are determined by both the manufacturing method and the choice of the stabilising media. 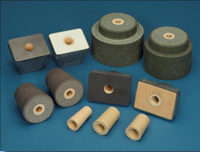 We manufacture a comprehensive range of zirconia ceramic metering nozzles used for the continuous casting of steel. Nozzles can be supplied in zirconia or zircon, either as solid nozzles or enclosed within a co-moulded outer body. The composite nozzle method of manufacture allows a nozzle to be manufactured without the use of cement jointing. This system allows the use of a high performance zirconia ceramic insert with a lower grade outer material. We offer ZPZ, ultra high performance zirconia nozzles. The performance of this type of nozzle is in some instances exceptional with many casting sequence records achieved. Advanced forming methods endow the nozzles with both high and uniform densities. A range of zirconia / zircon atomising nozzles are manufactured for use in the Powder Metallurgy industry. Nozzles are available in a wide range of shape and size, many to the requirements of individual customers. One of the principle features of Zircatom nozzles are there close dimensional accuracy which promotes stable flow characteristics under the most arduous conditions. The addition of specially selected stabilising oxides provide high strength, excellent erosion resistance and minimise cracking due to thermal shock / rapid cooling. Yttria stabilised zirconia with excellent erosion properties. High temperature resistant, suitable for super alloy and nickel based alloys. Ceria and magnesia stabilised zirconia with excellent thermal shock resistance. High temperature resistant, suitable for super alloy and nickel based alloys. Zircon nozzle's with zirconia ceramic enhancement for low temperature, gas and water atomisation of aluminium and copper alloys.